Two days back, a sovereign kangaroo court sprung up outside a district court in Delhi. It has delivered instant justice. Its jury is a mob dressed in black that identifies anti-nationals by their looks - beards, notebook, jhola and pen in hand is usually the giveaway. It beats them till they either run away or begin repeating 'Bharat maata ki jai' along. The court doesn't discriminate between men and women. And it's helped or at least abetted by police, more than 100 of whose soldiers have been deployed in this territory at all times, which ensures that nobody comes between the mob and traitors. And this court doesn't recognise laws of the land of India, whose flag its jury fervently waves, where lawyers remain inside courtrooms, police acts on complaints, and journalists report fearlessly. But this mob, which till last week was a group of practising lawyers at the Patiala House court, doesn't have to fear any reprisal because Delhi's top policeman BS Bassi refuses to bring them to book. On being asked why his men have not acted against violence inside the court premises, Bassi said, "Lawyers are officers of the court...use of heavy force would have been inappropriate in this case." 'Officers of the court' had a busy day of work on Wednesday. They abused and threatened to beat up journalists, thrashed some other lawyers, attacked Bassi's own men, thrashed a reporter from Firstpost, attacked another journalist from AP, beat up the undertrial - JNUSU president Kanhaiya Kumar. 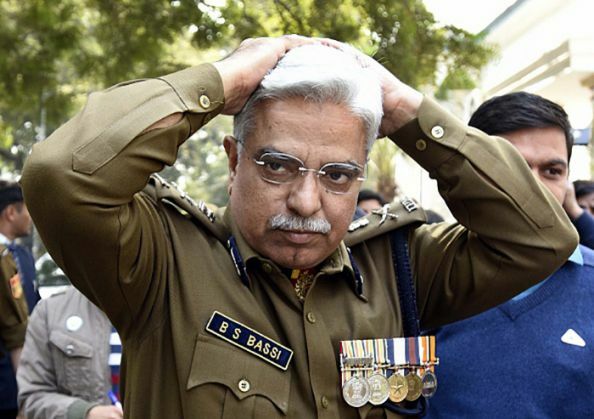 It's not as if Bassi's men don't know how to swing their lathis. They didn't have to wait for a provocation when a group of unarmed students marched near the RSS headquarters in Delhi last month. But it doesn't bother Bassi that just half a kilometre from his office 'officers of the court' have been running a riot. For 2 days journalists have been thrashed on camera, and the attackers have boasted about it in interviews, and not one arrest has been made. Journalists were brutally attacked on Monday, who returned to work with bruises that Bassi described as 'minor injuries, were again besieged from all sides on Wednesday. And not one policeman came to their rescue. And no one came to the rescue of Kanhaiya Kumar either. It wasn't just bad planning on the part of Delhi police which put barely 10 policemen to secure Kumar who was being brought to Patiala House court which was full of violent hooligans. Vikram Singh Chauhan, the lawyer with BJP affiliations, who organised the attack on JNU faculty and journalists on Monday was roaming around Patiala premises with a stick in his hands, inciting people to attack "anti-nationals". This is how his friends described the attack on Kanhaiya Kumar, "hath jod ke khada tha saala. Itni laat maari ki saale ka peshaab nikal gaya... Nahi maano to dikhaun kahan us kutte ne peshaab kiya. 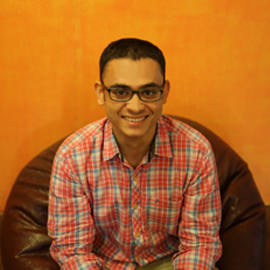 Humse daya ki bheekh maang raha tha jab laat ghuunse pad rahe the usse." 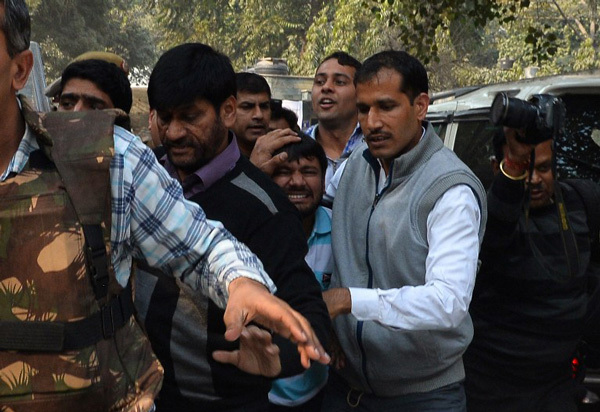 Kanhaiya being escorted by police into Patiala court. Photo: Chandan Khanna/ AFP Photo. 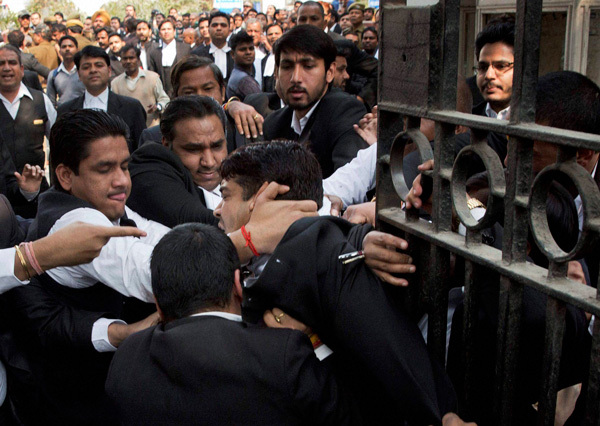 Kumar was punched in the face, on his legs and his stomach by more than 50 lawyers. Many journalists present on the spot, including this reporter, were witness to it. Bassi has been the most inactive, inarticulate, and incompetent police chief Delhi has ever seen. Senior advocate Rajeev Dhavan, who was among the five people Supreme Court appointed to look into violence at Patiala court, reported back to the Apex Court that obscenities were hurled against him and his colleagues. As his retirement nears, Bassi is behaving more like a BJP muscleman than as the chief of Delhi police. He was lying through his teeth when he said that the incident with Kanhaiya was a mere 'jostle'. The police commissioner shamelessly gave a clean chit to members of ABVP's JNU members and claimed Kanhaiya to be an anti-national, just as the lawyers of Patiala House court did. And look how the outgoing police chief has embarrassed not just himself but the entire force of 70,000 he commands. All the resources and effort that went into interrogating and investigating the case against Kumar have come to nothing. The police could get nothing after interrogating Kumar for 48 hours and now Bassi "personally feel[s], a young person [like Kumar]...should perhaps be given bail". All the video evidence that Bassi claimed to have in possession, which would have proved the charges of sedition that Bassi slapped on Kumar, have already been rubbished by the IB. BS Bassi has undoubtedly been the most inactive, inarticulate, and incompetent chief of police staff Delhi has ever seen. But for him to behave like a bouncer of a political party is more unfortunate for the respectable officers he commands and for the people whose security is his responsibility.